Metal Roof vs. Shingles – What your Regular Roofer will Never Tell you! Your home is your most prized possession, and no other roofing system can keep it better protected than a metal roof. For discerning homeowners who want to make a long term investment into their home, and to be sure that they are getting a premium roofing material, metal shingles are a top choice. While they come at an initially higher price than asphalt shingle, metal shingles offer an unbeatable array of advantages compared to other roofing materials and systems. Metal shingles are designed and built to withstand the most adverse weather conditions such as ice and snow storms, hail, heavy rainfall and hurricanes, which makes them a prime choice for homeowners who live in areas that get frequently hit by these natural calamities. Metal roofing shingles remain virtually unaffected by any fluctuations in temperature. They are also not susceptible to rust or moisture related problems such as moss, mold and mildew, all of which can cause major damage to more common materials like asphalt shingles or wood shakes. 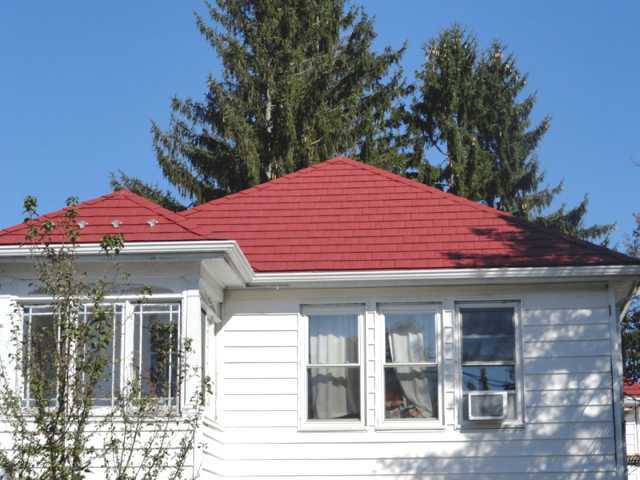 Metal shingles will meet all the aesthetic needs of even the most discerning homeowners. Metal shingles are available in a wide array of designs, finishes, and colors, making it possible to achieve any style you desire from contemporary, to traditional, to rustic. The best part is that unlike composition (asphalt) shingles, metal shingles will maintain excellent looks even years down the line, almost unaffected by the wear and tear caused by natural elements. What also helps to keep a metal shingles roof looking like new for many decades, is their resistance to stains and streaks caused by mold, mildew and airborne algae. As a result, a metal shingles roof not only has great curb appeal, but will also increase the value of your home, should you ever choose to sell it. Metal shingles have warranties of at least 50 years and will essentially last a life time, provided that you get a high quality roofing installation from a professional installer who specializes in metal roofs. By choosing to invest into a metal shingles roof, you are guaranteed to not ever have to do another re-roof in your life. Metal shingles are installed from eaves of the roof, going up. They are typically installed in rows, and interlock with each other, creating a durable water, ice and wind resistant roof covering, made out of long lasting metal. Metal shingles are installed horizontally, allowing roofers to install any necessary roof safety equipment such as “roof jacks” or staging, which makes the installation easier AND safer. Unlike a standing seam metal roof, interlocking metal shingles are relatively easy to install, and offer great flexibility, due to low profile design, and lack of ribs (seams) that stand up by almost 2 inches from the roof deck, and requiring special curb construction. When it comes to complicated roof flashing details, such as skylight or chimney flashing, valleys, and even simple roof penetrations like pipe flashing – it is much easier for a roofer to flash these protrusions with a metal shingles, making the cost of a metal roof significantly lower (metal shingles material also costs about 40% less than standing seam, so your overall roof cost will be less). Metal shingles provide excellent insulation for your home, keeping the temperature inside at a comfortable level, regardless of the temperature fluctuations outside. Because a metal shingles roof has high thermal reflectivity, it will keep the house warm in the winter and cool in the summer. During the summer, a metal shingles roof makes your home cooler by efficiently reflecting away sunlight and reducing the amount of heat transmitted inside the house. Likewise, it makes the house warmer in the winter by reflecting inside heat from the underside of the roof back into the house. This means that you will be saving a lot of money on the ever increasing heating and cooling costs. Homeowners across the US consistently report energy savings of as high as 20% after installing a metal shingles roof. Because of their exceptional durability, metal roofing shingles are virtually maintenance free, regardless on the climate you live in. This means that you not only save yourself time and the hassle of having to take care of your roof, but also additional money that you would spend to do professional maintenance necessary with other roofing materials. Most modern metal roofs including metal shingles, have recycled content that ranges from 25% to 95%. This is in stark contrast to other roofing materials such as asphalt roofing shingles, which have a much shorter service life and use oil-based products as their primary raw material. Metal roofing shingles can also be recycled at the end of their long service life, instead of going into our landfills. Moreover, if you are doing a re-roof, a metal shingles roof is light enough to be installed over your existing roof, which means that you will not need to send it to the landfill either. How Much Does a New Metal Roof Cost? Standing Seam Metal Roof Installation Details – Will Standing Seam Work on your Roof? Is Metal Roofing the Right Option for Your Home?